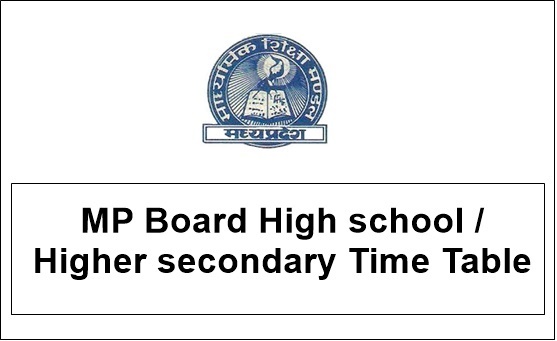 MP Board 10th Time Table 2019: Madhya Pradesh Board of Secondary Education (MPBSE) has announced the High School Exam Time table 2019 at mpbse.nic.in. Students pursuing the 10th Class/High School in MP Board can check the Madhya Pradesh 10th time table from the MPBSE Official portal. The MP 10th Date sheet 2019 will be accessible in PDF format, students can check the exam dates, timings from the Time Table. Students will also have given access to download MPBSE High School Admit card before examinations. The MPBSE 10th class examinations will be held from 1st March to 27th March, 2019. Students can check the complete details below. Madhya Board of Secondary Education (MPBSE) has released the date sheet for class 10 and 12 examinations on the official website. The board will conduct class 10 exam from March 1 and it will end on March 27. The examinations will be held in a single shift from 9 am to 12 pm. The exams for physically challenged students will be held from 1 pm to 4 pm. MP Board of Secondary Education offers the quality education for secondary / higher secondary classes in the state. The MPBSE was established in the year of 1995. From then, many of the batches were passed out with certification from this board. The board organizes 10th and 12th examinations in time and releases the results in scheduled dates. Students pursing under MPBSE gets the quality education from the board. Students presently studying the 10th class and 12th class in MPBSE can shortly check their board exam time tables from the MPBSE Official portal, mpbse.gov.in. The time table for both English/Hindi languages for private and regular students will be announced. The Madhya Pradesh Board is going to announce the MP 10th Date Sheet 2019 on its official portal. Hence students can keep checking the official portal on regular basis. After announcing the timetable, students can check the subject-wise exam dates and timings from it. Last year the MPSC has released the 10th exams timetable in December and the examinations were held from 1st March to 27th March. This year also the MPSC may follow the same scenario. Hence students can be attentive to check more details. Stay visiting our page for latest information regarding MPBSE 10th Class Exams. Here we shall update the MPBSE 10th /SSC Date Sheet 2018 soon after the board announces the time table. Instructions: If any public or local holiday is declared by the government in the examination period, then the examinations will be completed as per the schedule. Practical examinations will be conducted between 12 February to 26th February, 2019, and the regular examinations in their respective examination centers from 7th March to 31 March 2018. All exam candidates must be present at the examination center at 8:30 in the examination room. No student will be given admission after 8:45 pm in the examination room. On the homepage, MPBSE 10th Exam Time Table 2019 Link appears; Click on the Link.